Enjoy a hot, fresh-from-the-oven slice of nutty banana bread with your coffee and relax, sis. Whenever I get stressed, I eat nuts instead of chocolates. And it’s not because they’re healthier, but it’s more on the fact that they’re the best nibbles that I can eat all day without getting tired of the taste. They’re not too oily, a nut quality that usually makes me lose my appetite and stop eating. Moreover, I notice that they make me alert, enabling me to concentrate on my work better. They also make a killer banana bread. One of my favorite nuts is walnuts. Give me a pack of walnuts and a book, and I am ready to lounge on my favorite couch and have a relaxing day ahead. Walnuts are the easiest things to eat, with them being soft and crunchy at the same time. They also do not easily spoil. I don’t worry about stocking too much on my shelf. And of course, they easily go with my favorite fruit, the banana, when I am in the mood for a dessert that’s not too sweet or too rich. USE THE RED NEXT PAGE LINK BELOW FOR THE BANANA BREAD RECIPE. 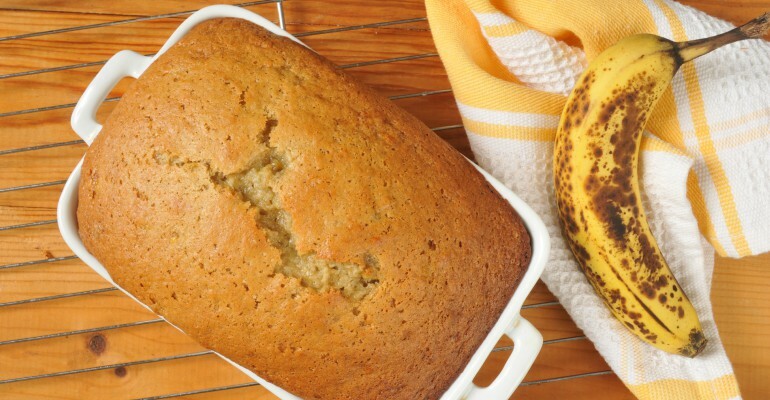 Quick Tip: Banana bread is best on the second day. Wrap cooled bread tightly in plastic food wrap. Refrigerate overnight.